Bell, 11 months, traveled from Texas to Florida. A puppy is back home following an unscheduled cross-country trip that had her owners worried sick. Bell, an 11-month-old miniature Australian Shepherd, ended up almost 900 miles from her Texas home in a town near Jacksonville, Florida, NBC affiliate FCN reports. She was brought into the Clay Humane Society as a stray but a microchip implanted in the pooch helped staff trace her back to her Texas veterinarian. “There is so much we don’t know about her getting here, but she is in fantastic shape,” said Dr. Christian Broadhurst, senior veterinarian at Clay Humane. Bell was found with no significant wear-and-tear to her paws, which probably meant that she may have received a ride along the way, the staff believes. 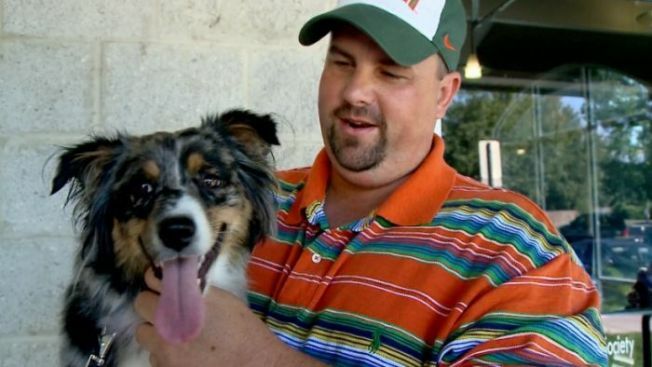 Bell’s owner, Matt Turner, and his son had been searching desperately for the dog and flew to Florida to retrieve her. “The first thing I said when I talked to the shelter here was, ‘Are you sure that it’s my dog?’" Turner said. "They said, 'We’re 100 percent sure that it’s her.' "